Lawrence Anthony passed away last week. If you know his name, it is probably as the man who was responsible for rescuing animals from the Baghdad Zoo when it was abandoned and looted during the U.S. invasion of the city in 2003. Babylon’s Ark: The Incredible Wartime Rescue of the Baghdad Zoo begins with the story of an incredulous border guard who tried to convince the South African conservationist and his Kuwaiti colleagues that they should “worry about your own sorry asses” rather than take supplies to Baghdad to care for the animals they hoped were still alive there. Anthony didn’t listen. Instead, he navigated the violence and politics to protect, feed, relocate and eventually, to rebuild a safe haven for animals that had been living in the zoo and in the palaces of the ruling family. The U.S. Army eventually awarded Anthony a medal for bravery in recognition of his service to the animals of the Baghdad Zoo. A handful of other international organizations also gave him awards for the commitment that the border guard thought was crazy. When he went back to Africa, Anthony defended rhinos (the subject of his soon-to-be-released book The Last Rhinos: My Battle to Save One of the World’s Greatest Creatures). He continued his work on behalf of animals in war zones through his non-governmental organization, The Earth Organization, and by spearheading an effort in the United Nations, called the Wildlife in War Zones Resolution to have zoos, animal reserves, parks and veterinary facilities deemed off limits as military targets. He also befriended elephants (The Elephant Whisperer). Anthony established a deep and lasting bond with a herd of elephants who lived on his private reserve in Kwa Zulu Natal, South Africa. 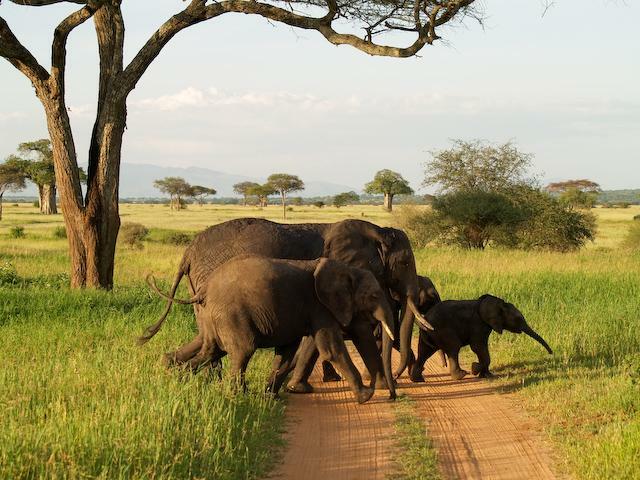 In all the teasers for the book these elephants are described as “rogues,” but they let him join their family. They hung out with him. Proud parents brought their babies to his house show him. A couple of years ago they went their elephant way. They came back this week to say goodbye to their human friend. When I heard this in the NPR story about his life yesterday, I burst into tears. Some people may need more proof that the elephants got the news and made the 12-hour walk from their current home ground specifically to bid farewell to a man who reached out to them with respect and kindness that they don’t always experience from humans. My tears are enough for me. The image of the elephants crossing the road was taken by Jeremiah Blatz in Tarangire N.P, Tanzania, in 2007, and is used here under a Creative Commons License. UPL, Thank you for sharing this story of an amazing man. I went to NPR to hear the program you mentioned. Very touching. I also bought the “Elephant Whisperer” book for my niece who loves elephants and is going on an African safari this summer with my sister. I’m sure she will enjoy the book. Our connection with animals and theirs with us is truly wonderous!